I have seen huge success from my blog in a short amount of time and all it took was getting seriously organized when it came to scheduling my time and social shares. If you are hoping to get organized in your day to day life, I highly recommend the Simplify + Planner and you can read my full review on it here: Organize Your Life for the New Year. If you want to know what it takes to get seriously organized when it comes to your blog’s content, then read on. This post has all the best things to consider when creating your blog as well as how to organize your blogging schedule itself. I promised myself I would never blog about blogging until I had started making an income from it. Any information I share is tried, true and something I completely believe in. The reason I share about blogging is in order to help other bloggers see success on their own blogs. I have put all of my knowledge into an easy to use, super informative Blogging Basics course. There are 5 free lessons to take full advantage of as well. Getting a calendar organized for your content is the best way to keep track of what you have coming up. It’s also important to use your calendar to keep an eye on upcoming major events and holidays. Take Christmas for example. Planning content for Christmas at least 1 month in advance is a sure way to make sure that your content gets seen and shared before Christmas has actually passed. I have a calendar here that easily allows you to write down your content for each upcoming month. Learn from my mistakes and actually use a pencil! Things will change, stuff will come up and you will have to change your calendar so be sure to use a pencil. All these posts are related or similar to the one I am currently writing. Now I have given people with an interest in blog schedules and organization a chance to click through to other links on my site that may of interest to them. When you are creating and planning your content, it’s important to also be mindful of past content to share that might interest your readers. This also helps with search engines and gives people the chance to click through and read more content on your site. 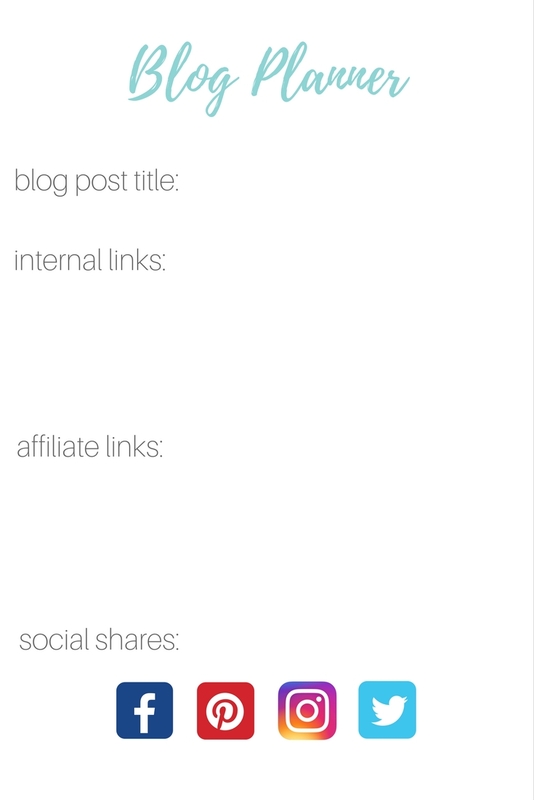 Affiliate links are super important when creating a blog post. Once you have a topic in mind that you want to write about, figure out which affiliate links you’ll be using. Instead of trying to completely wing your post and your links, it’s a good idea to get it all down and prepared. This is a great way to keep your post clear, clean and direct. No one likes a spammy post filled with tons of affiliate links. Don’t make that mistake by not planning ahead. There are two important things to remember when working with affiliate links. Always tell your readers that you are sharing affiliate links. Don’t use affiliate links just to try and make a quick buck. Make sure your links genuinely fit with your content. It’s important to build trust with your readers by being honest with your affiliate links . Just like it’s wise to plan your internal links, it’s also important to remember to get a strategy down for your affiliate links as well. There is a super easy printout I use that helps keep these things easily together and you can get your own copy here. After you have created a quality post that everyone wants to read be sure to share it across all your social medias. Once you have done that you can cross it off your check list! It’s a simple way to keep track so you don’t forget. The best way to figure out how to keep your schedule is to just go ahead and get started! 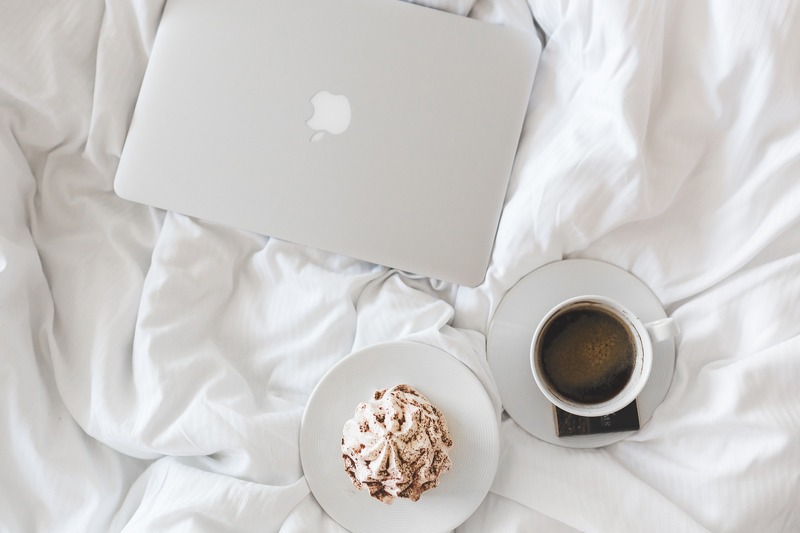 Be patient with yourself, blogging is definitely a thing of trial and error! 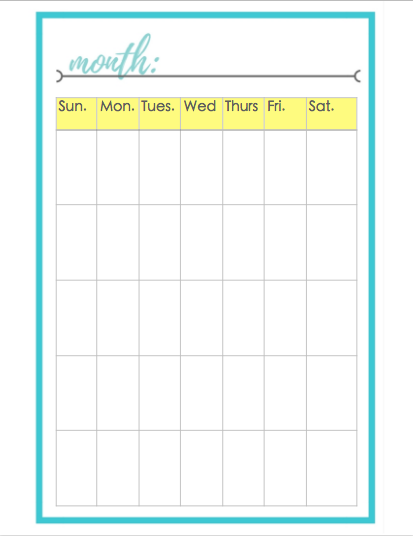 I never thought about making a separate calendar just for blogs – I usually keep the information in my regular planner. But being such a visual person, this definitely seems like a better way to stick to it. Thanks for the tips! I get that. I am a very SEPARATE person. If I put too many things together my thoughts get jumbled…my head is already full of too much! Thanks for all the printables! I definitely need to get more organized with my blog. I do fairly well with when to post, etc. with my planner but I need to focus more on social media sharing and the like. Yeah I plan to share more on my social media sharing strategies later! Once I got that down, it was amazing to see the huge change! Glad you liked them. Starting a blog really taught me organization! This is a really detailed post and great ideas to keep you organized. I definitely agree that Internal Links are extremely important especially for SEO purposes!! Thank you for sharing!! Absolutely! Probably should throw that lil tid bit in there! I usually just blog about whatever news or event comes up at the time and that catches my attention. But having some organization is certainly a good idea and the calendar printout you provide is a positive first step. That’s awesome that you can keep up with that. I used to blog that way and my attention span just didn’t allow it! haha. I needed to hold myself accountable otherwise it wouldn’t get done. I think I need to start placing more internal links in my posts. Thank you for the tip! Great reminder on the blog calendar. I have one, it is filled in….but I often just blog on what is on my mind. 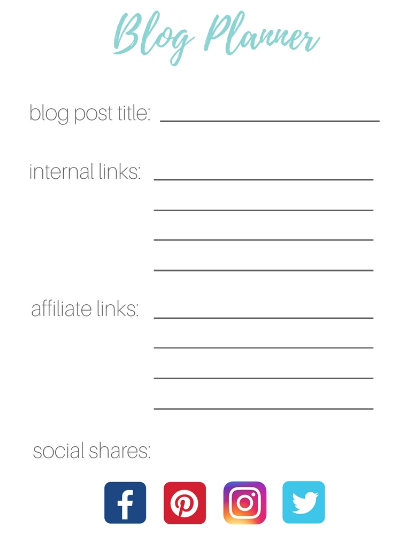 Using the planner is a much stronger way to grow my blog and social shares. Thanks! Planning is key. I agree with your advice. The only thing I’ve been doing is saving links I can add to my blog posts. Planning is so important and is something I struggle with. I work a full time job, so it’s hard to fit everything in. I need to be better at specifically planning out my content. Thanks for the tips! Yeah that would be tough! I have to keep flexible for sure but definitely need a way to keep my focus! Hope you found some tips that will help! This is such a great post. I have an excel document that I’ve turned into a blogging calendar/checklist, but you have reminded me there are a few things I need to add! I also appreciate the reminder to link ‘old’ posts back into some of my blog posts. I feel like I do a decent job of doing that with new posts that I write, but not going back through older posts and adding links to some of my newer stuff. January was a big month for me “revamping” old posts! It really helped boost traffic too! Because I felt like I was promoting stuff all week long! I’ve been blogging for exactly 2 months today. I’ve been struggling with creating a schedule and sticking with it. I’ve created a blogging planner type notebook and still haven’t used it as planned. I’m hoping that I can create a schedule and follow thru with it. Give yourself time! It takes a while to get the hang of this blogging gig…it has for me! I feel like I’m running in a bunch of different directions right now trying to get everything in working order. I know that I need to sit down and get a better schedule for blog posts. I think if I do that it will help me manage my time better to accomplish the other things on my to-do list. Thanks for the printable’s! You bet! Hope you can get everything in one place! I always say I’m going to plan out my blogs, but never end up getting around to it! I’m one of those people who like to go with the flow and it’s hard for me to stay on track if I feel called to post something else. You have great ideas. Thanks for sharing. I definitely get that! Lately I have gotten really good about sticking to everything but there are definitely times I have had to scratch something from the list! I also used Building A Framework (listed in your resources at the end of the post). It is such a great investment. It’s really not that expensive for the quality of the product. After blogging for several months, I still go back to it as a reference tool! Just went through it again yesterday! I really struggle to plan my posts in advance because I am very much a “write when inspiration strikes” kind of gal, but I know that I need to in order to be more successful! I very much had to overcome this as well. 2017 was a big year of discomfort…pushing my limits and such but it has paid off huge! This is exactly what I need right now! With working full time and going to school full time I need to make sure I am keeping my new blog on track as well! 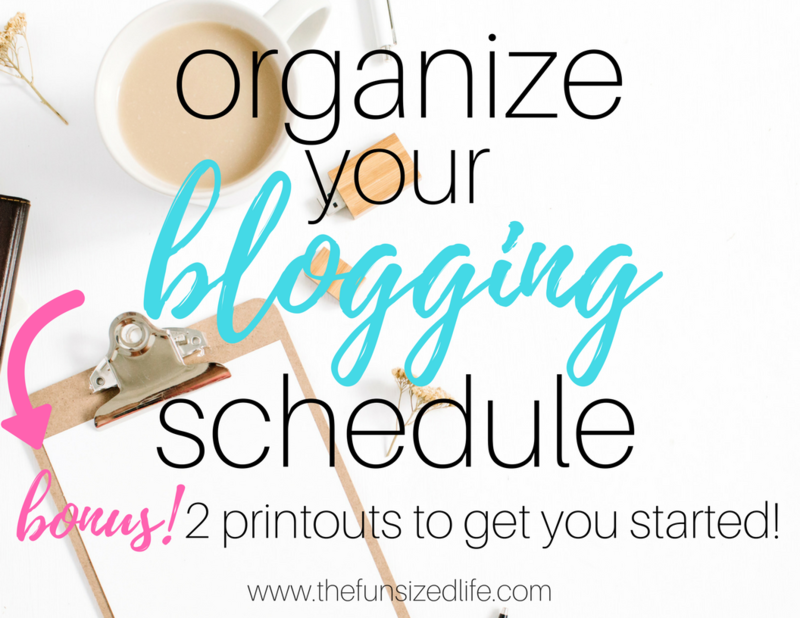 These are some great tips and I am definitely going to be checking out your printables! Oh my goodness! You are doing awesome and I’m glad I could help you out you busy lady! I just saved this so I could read over it again. Thank you so much for gathering all of this information. Great post and I signed up for your blogging bloopers course- can always learn something new! Absolutely! I love reading fellow bloggers content because there is usually some knowledge to gain! Thank you for the inspiration to bring more balance and intentionality to my scheduling! So glad I could be a little help! Great tips! My google calendar has been my go to for blog planning. Now I think I need to up my game and plan out the affiliate links and do more social shares. Thanks! You bet! Glad I could give you a few new ideas! This is a great list. I am new to blogging and I am trying to figure out how to have enough time to start making some money from it so it is worth my time, but also I love writing and so I want to make sure that I am posting things of value and substance and not just to post or make money. Plus getting started is a lot harder than I anticipated. Absolutely! I tried too hard to make money right away. It took me a while to fall into my natural talents…it’s like I was working against myself. This is really helpful! I have been loving your blogging series, it has been really helpful since I’m trying to get my blog up and really running this year. One thing that has helped me a lot was planning my schedule and posts for the whole first quarter of the year at a time, and then jotting down ideas and changes as I go! So glad you are liking the course! You sound like you are definitely on top of your schedule! That’s awesome! Really great tips! I’ll be looking into some of the links you posted too like Share a Sale. I don’t believe I ever heard of it but it sounds like a great idea. So helpful – thank you! Share a Sale has been awesome especially when it first came to starting working with affiliate links. I’ve been much more consistent in my blogging habits since I started creating a schedule and a plan. But I never thought to plan out my internal and affiliate links before. I’m still trying to figure out the best way to have effective affiliate links. It helped me a lot getting a clear plan for them! Hopefully you can find something that works for you! This is great… I could totally use this idea for my YouTube channel! Great! I’m sure it definitely can help with many different things! What an awesome post! I sure took a lot of advice and encouragement from it. I’ve noticed that when I plan my posts and links aheaad of time they do better and I’m less stressed! Same here! I’m so glad you feel encouraged. I really hope to help others as they work to improve their blogs. Great ideas! These printables are awesome! Getting organized can be the biggest hurdle for so many things. Thanks for sharing lovely. I used to blog previously without using a schedule, and this didn’t work very well for me. You’re absolutely right – planning is so important to stay organised. I now have a hard copy planner *just* for my blog, and I am so much more productive. It really keeps me on track! I use a pink pen that rubs out. It is THE best! 😀 Totally agree things are always changing and getting shuffled around! A pink pen that rubs out?!?! I don’t think I could be more excited! I’m going to have to find that STAT! Setting a schedule and keeping it is so important. It just keeps you organized. You have some great ideas and visuals to keep it together and not forget anything. Thanks! I have just created a planner to try and organise the 2 posts a week I am trying to publish to a schedule. Sounds pitiful, but I am hoping to start small and grow. I haven’t even done an affliate link but may look into it. I am definitely going to look into the resources you have mentioned and am going to start planning my internal links more. Thank you for all the useful tips. That is awesome Cherie! Doesn’t sound pitiful! We all have to figure out what works for us! I need to plan content in advance! That’s my biggest downfall! I love this post so much, I pinned for reference! I seriously need to get back to a scheduling routine. I used to schedule my posts but then I got sick…then one by one, everyone else in the family did too, so I completely botched it all up after that lol ? New year means I’m getting back on track! I first started blogging almost 10 years ago just as a place to update family and friends but started my current blog a little over two years ago. Now that I’ve been at it for a little while, I definitely have some things I want to change (like moving from Blogger to WP) but I’m just trying to take things one step at a time. Thanks for all the great tips!